Despite this recidivism, the world today is closer than ever to eradicating polio. In 2015, there were just 74 new cases of the disease – 80% fewer than the previous year and the lowest annual total ever. And all of the cases were concentrated in just two countries, 54 in Pakistan and 20 in Afghanistan. Moreover, it has been eighteen months since the virus was last detected in Africa. The reasons behind this remarkable turnaround are instructive, illustrating the challenges facing public-health workers and the best ways to overcome them. The barriers to polio eradication are no longer medical; the disease does not occur where vaccination programs operate unhindered. During the past five years, polio cases have occurred almost exclusively in five conflict-affected countries: Nigeria, Pakistan, Afghanistan, Somalia, and Syria. Because immunization programs are led by national governments and the WHO, which, as a specialized agency of the United Nations, works closely with incumbent regimes, it can be difficult to carry out vaccinations in areas where militants wage war against the state. The fall in the number of polio cases largely resulted from improved access to such areas. In Nigeria and Pakistan, vaccination programs were able to proceed after troops asserted the state’s control over conflict-affected territory. 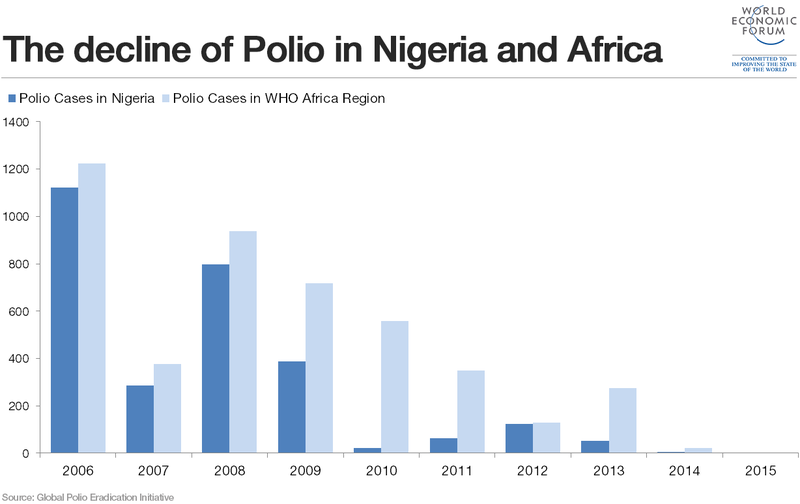 Most polio cases occurred in northern and eastern Nigeria, where the terrorist group Boko Haram had killed and kidnapped immunization workers, disrupting vaccination programs and leaving more than a million children unprotected. After a regional military force pushed the group into sparsely populated mountains and forests, immunization workers were provided access to previously rebel-controlled areas. In Pakistan, polio is concentrated in the Federally Administered Tribal Areas in the northwest of the country, where the Taliban are strongest. In 2012, militant leaders in the region banned immunization programs over concerns that they were being used to gather intelligence for drone attacks by the United States. Consequently 1-3.5 million Pakistani children were not vaccinated. That changed in the summer of 2014, when the Pakistan military brought large areas of the region under government control. In the space of a single year, the number of polio cases fell from 306 to 54. Using troops to assert control over conflict-affected areas is not the only way to improve access for polio workers, and in some cases it may not be the most effective. In Afghanistan, Somalia, and Syria, the government was either unable or unwilling to assert authority over rebel-controlled territory. Instead, immunization workers adapted to the political reality and worked with militants to gain access to areas under their control. The Afghan Taliban have cooperated with polio vaccination programs since the 1990s. In most cases, local-level leaders have welcomed immunization workers, seeing vaccination programs as a form of patronage that reinforces their authority. The few polio cases that have been detected have been either cross-border transmissions from Pakistan or have occurred in areas where intense conflict between the Taliban and the Afghan government has temporarily disrupted polio campaigns. By contrast, in Somalia, the terrorist group al-Shabaab has historically forbidden polio workers from operating in areas under their control, viewing vaccination campaigns as part of a foreign campaign to impose a centralized government. One million children were unvaccinated between 2010 and 2013, when a polio outbreak occurred. Since then, immunization campaigns have improved their access to rebel-controlled areas by employing locally recruited staff to work within their own clans and negotiate access with local-level militant leaders. In Syria, after the start of the uprising in 2011, the government prevented the WHO from operating in areas outside its control. Over three million children were not vaccinated for polio, leading to an outbreak in rebel-controlled regions in 2013. In response, an ad hoc coalition, including moderate opposition groups, Turkish authorities, and local NGOs carried out a series of vaccination campaigns and contained the outbreak. The coalition negotiated access with local rebel leaders, allowing them to choose volunteer vaccinators. Militant groups – even the so-called Islamic State – permitted immunization campaigns to operate in areas under their control. The lesson is clear. Successful immunization campaigns must secure the support of de facto political leaders – whether of an internationally recognized state or of a vilified militant organization. As objectionable as working with groups like the Islamic State might be, it is important to remember that the main objective of efforts like the campaign to eradicate polio is to improve the health of people wherever they may live. Jonathon Kennedy & Domna Michailidou.